The Dairy was situated at 1801 Main Street. It was operated by Mr. Trudel and his spouse Mariette Gélinas. The business opened in 1953 and when the government imposed pasteurisation of milk, Mr. Trudel could not afford to buy such equipment so he simply closed the Dairy. The bottles were of clear glass. They never had the Dairy's name on them. 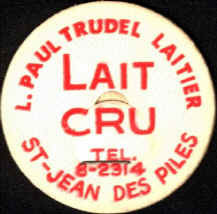 When the Dairy first starts, the caps were not identified, but the government required to have caps identified so the buyers could clearly identified the origin of the milk. Mr. Trudel was delivering about 50 quarts every day with his own car while he was working on an other job. We can say that this couple worked very hard to keep the Dairy running till 1971.